How can this be? Don’t passions lead to great careers? That’s the common thinking, but Newport found that this is actually a dangerous way to search for a rewarding career. Your passions don’t always translate well from what you’re interested in to what you do for work, for one thing. For another, how can you know what a career will be like if before you’ve tried it? An aspiring musician may be passionate about music, but can they honestly say they’ll be happy with music for a career? Of course not; after all, I don’t think any of us have ever had a job that perfectly met our initial expectations of it. These three ingredients, according to the Self-Determination Theory, enable you to achieve mastery in your work, and from there passion and happiness will naturally result. That’s right: rewarding careers are created through finding, refining and pursuing your skills, not your passions. It may take a while longer to enact this principle, but I think Mr. Newport is onto something. We too often give “passion” too much credit when it comes to finding a great job and growing in it. Newport, Cal. 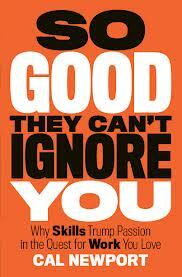 So Good They Can’t Ignore You. New York: Hachette Book Group, 2012.